Cooking is an enjoyable chore for many, what with the chopping, dicing, sautéing, frying and breathing in the amazing aromas. Feeding large and sumptuous meals to loved ones is a very rewarding experience and for that, you need a beautiful and practical kitchen. By organising the kitchen space properly and keeping the appliances and cookware in the right places, you can make your culinary journey comfortable and attractive. 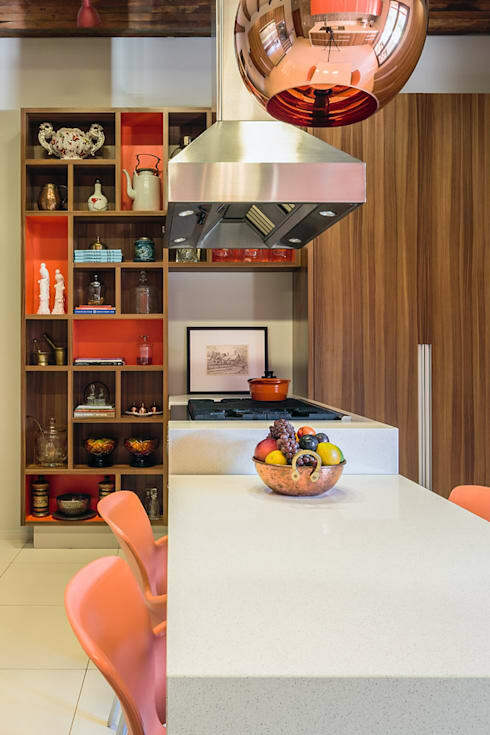 Here are 8 modern kitchens to inspire you. 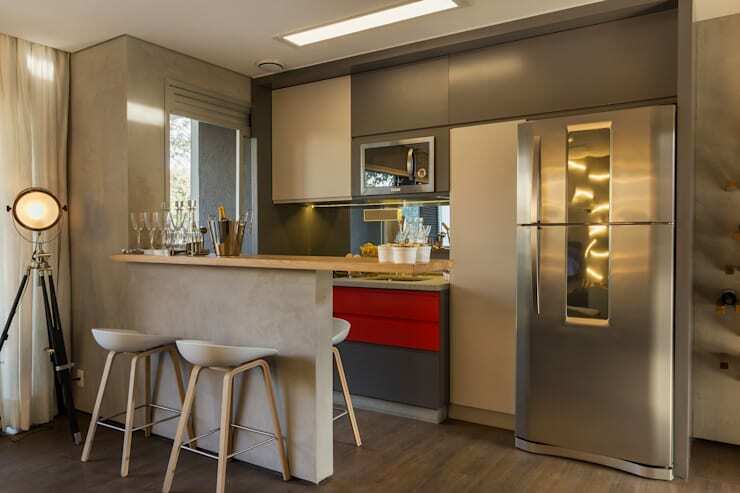 Rendered by the architects at Sarau Arquitetura, this trendy L-shaped kitchen counter is perfect for arranging utensils, plating and preparing small meals. Sleek and modern shelves in the background make it easy to store all and sundry. Small yet stunning, this bright kitchen looks welcoming and spacious in white. 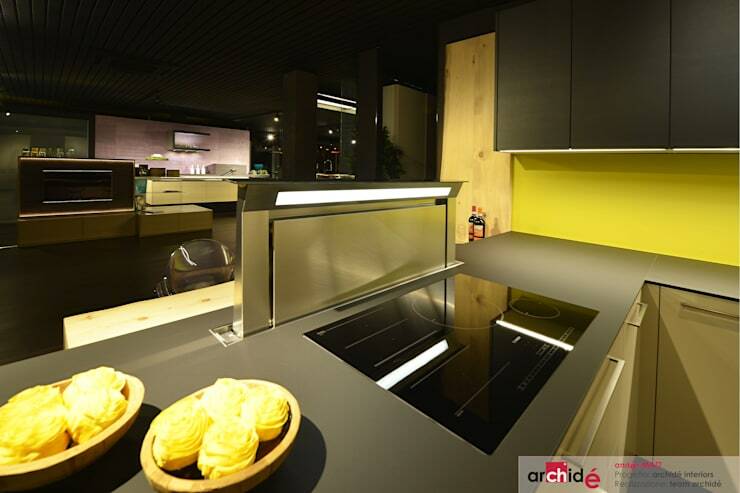 The island is minimal yet very useful with the chimney hood above, and the sleek cabinets add to the aesthetics. The kitchen opens up to a sunny balcony through sliding glass doors. 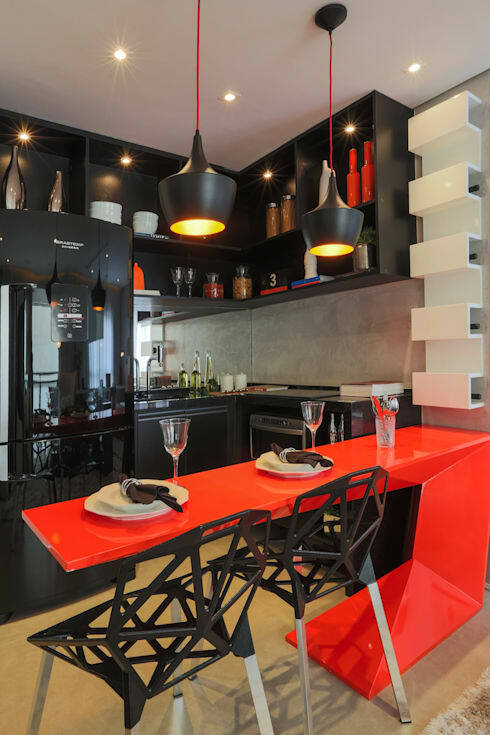 Bold hues are usually not the first choice for small kitchens, but this tiny corner kitchen steals the show in black and red. The L-shaped counter and overhead cabinets store essentials as well as display collectibles. 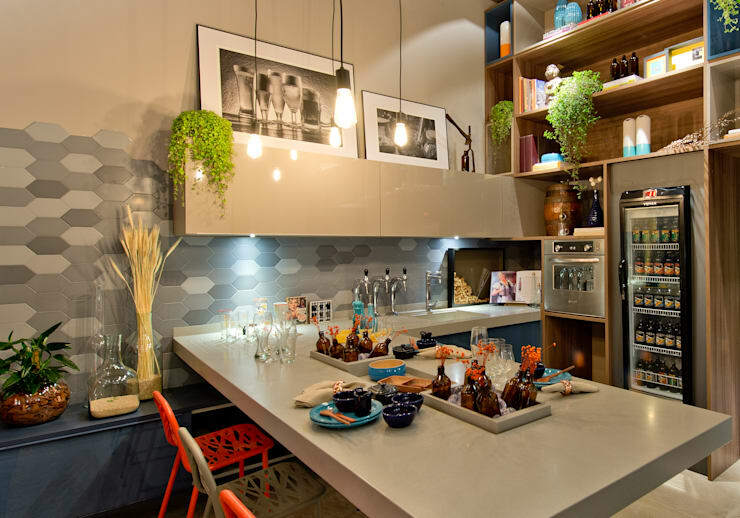 While the L-shaped black counter stores all the crockery and condiments, the vibrant orange counter promises stylish and quick meals. A couple of trendy black lights hang over this counter, perfectly complementing the snazzy chairs. Different and soothing shades of grey make this modular kitchen a wonderful sight to behold. 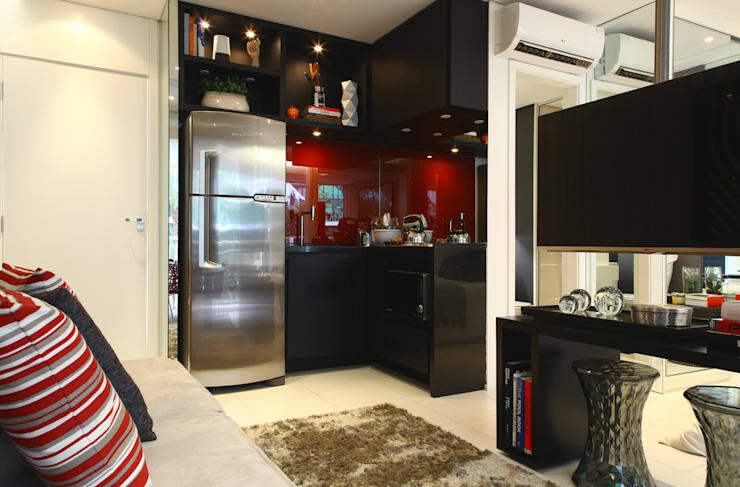 A special niche for the fridge and the layout makes working here a very breezy task. But what catches the eye is the extension of the wooden countertop, as it holds small decorative pieces for visual appeal. 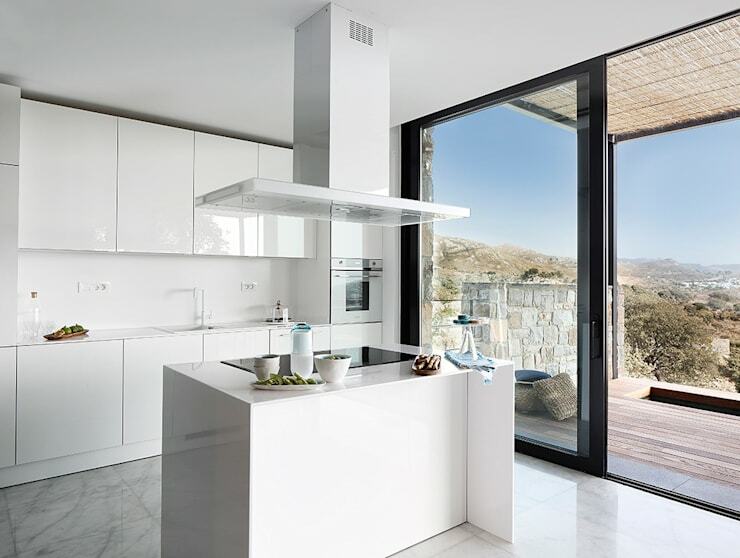 This cutting-edge kitchen is fitted with an ultramodern stove and other trendy appliances which make cooking a dream. It is indeed futuristic. We love how the kitchen island in this image has extended to become a dining table of a lower height. This idea is perfect when you are short on space. The island and the table also contrast the wooden shelf and the colourful decorative pieces nicely. 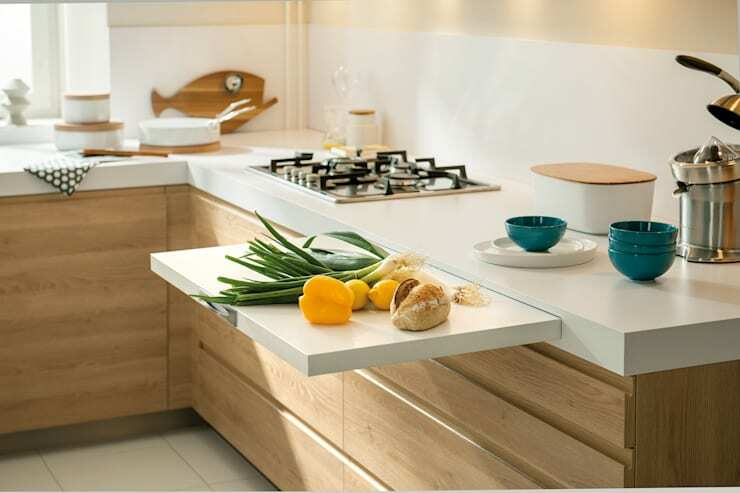 A chopping board has been brilliantly embedded in the kitchen countertop here, so that it can be pulled out when needed and stashed away when not in use. The smooth wooden countertop goes extremely well with the light-hued wooden cabinets here.